NFL Lays Out New Penalty For Domestic Violence: 6-Game Suspension : The Two-Way NFL Commissioner Roger Goodell described the change in a letter to team owners. The league was criticized for suspending Ray Rice for only two games after his arrest on domestic violence charges. NFL Commissioner Roger Goodell, shown here in January, has sent an open letter to NFL team owners explaining the league's new policies for preventing and punishing domestic violence and sexual assault. NFL Commissioner Roger Goodell has announced new guidelines for how the league will handle incidents of domestic violence and sexual assault. The change in policy, explained an open letter to team owners, comes a month after the NFL was criticized for how it handled player Ray Rice's arrest on domestic violence charges. Goodell says that the new policies were developed after conversations with outside experts, team owners and the NFL Players Association. The open letter describes several ways in which the NFL plans to provide training, support and resources to personnel, players and their families. It also sets down guidelines for how sexual assault and domestic abuse will be punished in the future. 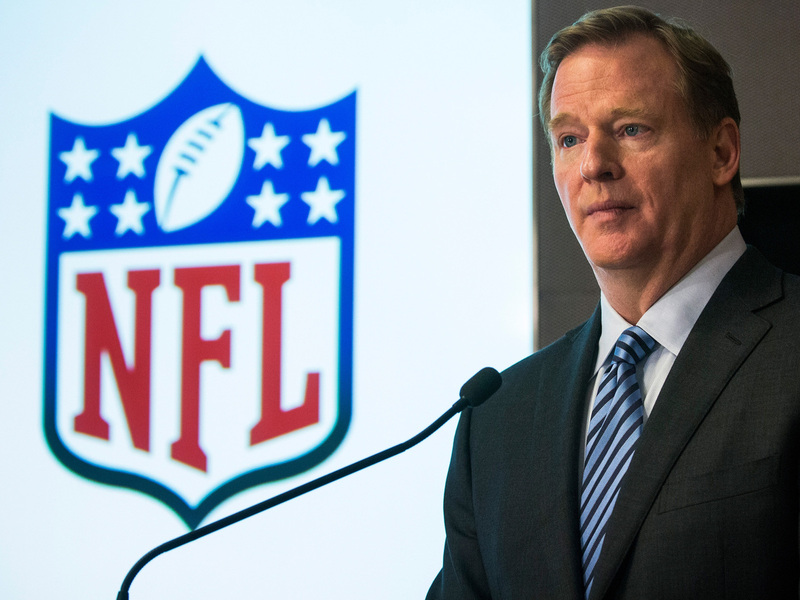 "Effective immediately, violations of the Personal Conduct Policy regarding assault, battery, domestic violence or sexual assault that involve physical force will be subject to a suspension without pay of six games for a first offense," Goodell writes, though the league may choose to make a suspension longer or shorter depending on various factors. "A second offense will result in banishment from the NFL." Baltimore running back Rice was arrested in February on charges of domestic abuse; a video circulated online showing Rice dragging his then-fiancee's unconscious body out of an elevator. Rice enrolled in an intervention program instead of going to trial, and publicly apologized for the assault. For Ray Rice, Is A Two-Game Suspension Light Punishment? As a result of Rice's actions, the NFL suspended the player for two games and fined him $58,000. The suspension seemed light when compared with the way the NFL punishes other prohibited behavior, as Bloomberg View columnist Kavitha Davidson told NPR's Scott Simon. "For reference, Cleveland Browns wide receiver Josh Gordon is facing a yearlong suspension for smoking pot," Davidson told Simon, and other players have received four-game suspensions for drug use. In the open letter, Goodell says that Rice's punishment was a mistake. "I didn't get it right. Simply put, we have to do better," he writes. "And we will." The letter also describes how the league hopes to identify risk factors to prevent assault and violence and indicates that the NFL plans to address domestic violence and sexual assault in its youth football programs and public service work. NPR's Only A Game has more on the planned changes.